The success of the artwork we created for a previous Cell Magazine cover spawned two additional assignments. 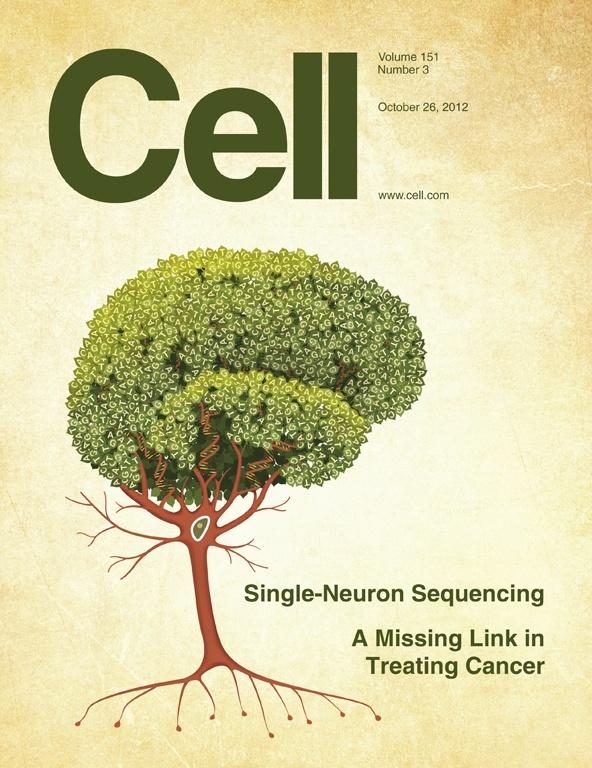 One of those was published in today’s issue of Cell in an article about single neuron sequencing. We worked closely with Gilad Evrony and Xuyu Cai of Christopher Walsh’s lab at Harvard University to develop an illustration that combines elements of a single neuron, DNA, and a brain, all in the shape of a tree. Now if I could just get my cell phone to work in the office. I don’t think I’ve ever found a reasonable use for a coxcomb chart, until now. It seemed to fit the bill for a recent project for The Foundation Center. With funding from the Rockefeller Foundation, they recently published a synthesis of success factors for small-scale coastal fisheries management in developing countries. 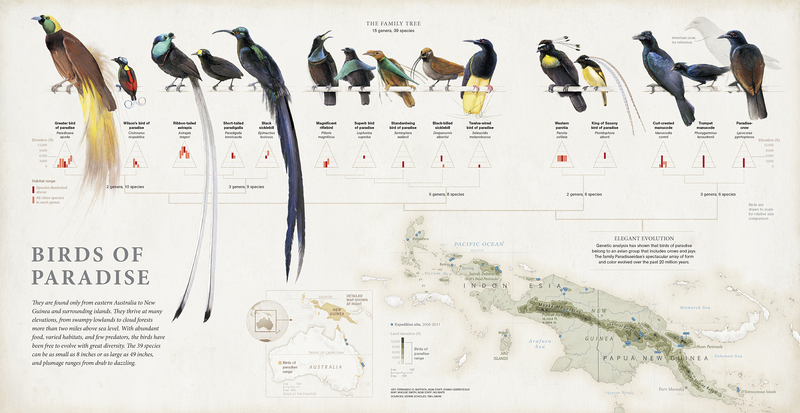 The Foundation Center hired us to create an interactive visual representation of their findings. It appears that fisheries have to balance a number (twenty, to be precise) of factors on different levels to be successful. We ended up using a coxcomb chart (or polar area diagram or rose diagram) as the base for an interactive presentation built on raphael.js. 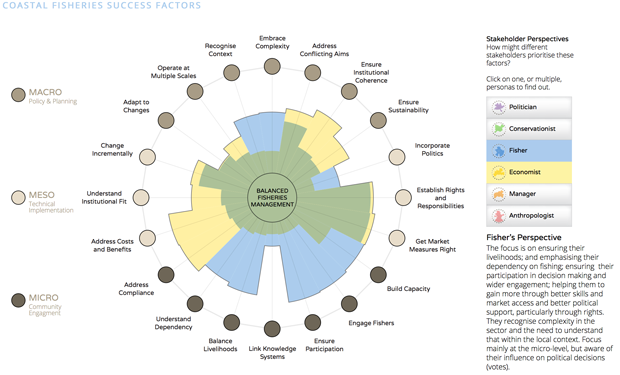 The interaction allows you to visualize how different stakeholders might prioritize the twenty factors, as well as drill down to get more detail about each of the factors. The coxcomb overlays do a particularly nice job (I think) of showing where there might be gaps in perspective that would encourage you to bring another stakeholder to the table. Overall, I think the impression is that there is a lot to keep tabs on if you are managing a fishery. The conceptual illustration of brains has become kind of a quirky side business for me. I’ve constructed brains with Lego bricks and Lite Brite pegs, and created a DNA brain tree. 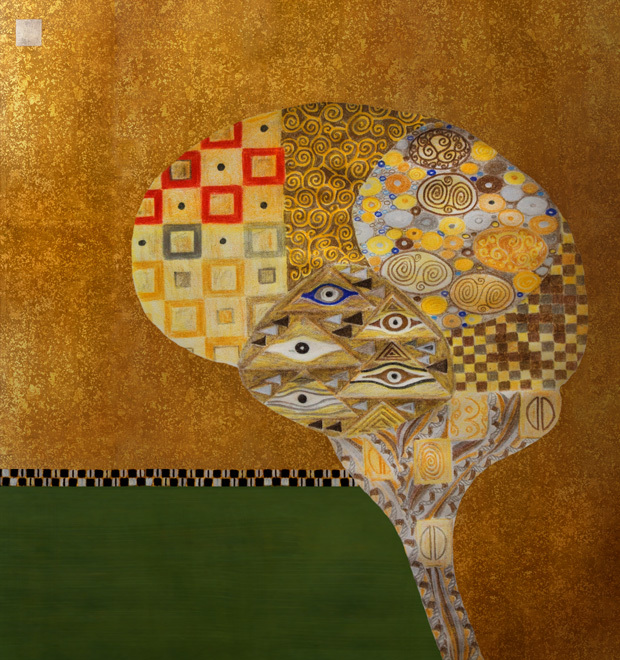 And now in the style of Gustav Klimt’s Portrait of Adele Bloch-Bauer I – this one to submit as cover art for a scientific journal (the paper was on mosaic mutation patterns in the brain). It’s true that you get to know a piece of art (and an artist) much more intimately when you try to recreate it yourself than you would by just studying it. Perhaps even more so when you try to capture the essence of a style and apply it to a new subject. The gold background and black and white checkered stripe are Klimt’s (the joys of public domain), but the rest is my creation. Dr. Markus Covert’s lab commissioned Threestory Studio to create cover art again for another Cell Magazine article. This time, the article had to do with the ability to track protein activity in a single cell. To quote the article summary: “Our technology converts phosphorylation into a nucleocytoplasmic shuttling event that can be measured by epifluorescence microscopy.” Got it? Good. Since the technology involves lighting up parts of a cell, a little light painting seemed in order. We found a nice stage with an already-lit circular cell membrane in the courtyard of the Clark Center building that houses Dr. Covert’s lab. Lab members formed the nucleus and Dr. Covert’s two young children did the running around, impersonating reporter proteins with colored LED flashlights. You can see here the version we submitted, mocked up in the Cell template (“ERK” stands for extracellular-signal-regulated kinases). The recent discussion on DataStories about Data Art with Jer Thorp resonates with this kind of “science art”. I recommend giving the podcast a listen. Here are a few additional shots of light painting I attempted after the lab members had left. I got a few curious looks from passersby, watching me wave flashlights around. In the middle of an empty courtyard. Late at night. Alone.